Each light brown tablet contains 5mg Pimobendan as it's active substance. My vet started my Border collie on this medication and recommended a private prescription costing £12.50. 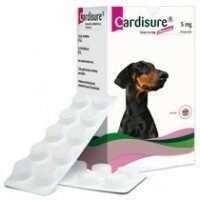 I send this via email to VetUk and order 3 months worth of cardisure medication. It has made the world of difference to my BC, she has gone from coughing all the time back to acting her happy self - she will occasionally cough if she gets over excited or it’s very cold when she is out. But these tablets are worth the money I spend. VetUK are the best place to buy them, I have a choice of free delivery from Royal Mail or £1.99 from DPD, which is what I choose as they are signed for. Maisy has half a tablet in the morning and half before before supper, she has got so used to them she will tell you if you happen to forget! Without this medication I wouldn’t have my wonderful friend as healthy as she is. VetUk is where I would always go for my pets medication because without a doubt they are the cheapest but also the best for customer service. They hold my private prescription for 6 months so I know we are covered - even my vet has said they can’t get this medication as cheap as I am so it goes to show how good VetUk is.